We had a great work day with two teams of workers working all over the baby home. The front doors were hung, the walkway railing got its final coat of paint, the stucco paper was started, the first layer of soundproofing was completed, and most of the electrical in the upstairs was finished. We are so thankful for everyone who sacrificed their Saturday to help continue the work on Grace Babies’ Home. PRAY - Pray for the logistics of bringing the drywall and insulation across the border and for the teams that will install them. 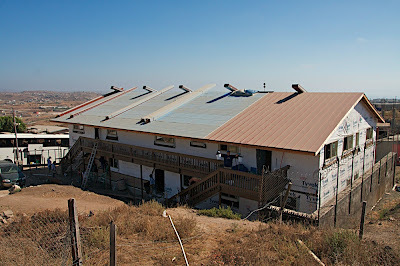 Pray for safety as we continue the roof installation this week. SHARE - Please continue to share these posts using the share button above. We have had several teams here this month continuing with various projects. The teams helped out with digging and painting as well as installing soundproofing materials between the first and second floors. Saturday, several guys came down to begin work on the electrical wiring. Though they had never met before, they worked enthusiastically side-by-side. They finished the day as friends, sharing a common passion - our Lord Jesus and His work here at Grace Babies’ Home. Also, a friend and brother in the Lord, has started coming every morning to work on the plumbing. He arrives at five in the morning and works for a few hours before leaving for his regular job. PRAY - We have several upcoming teams scheduled to continue God’s work at Grace Babies’ Home. Pray for productivity and protection while they serve. SHARE - Use the share buttonto share this update with your social networks. This will get more people praying for the project and give others the opportunity to follow God’s command to care for orphans. Youth from Church of Battlecreek came from Oklahoma to love on our kids at GCH and work on the Baby Home for a week. In their youth directors own words they came to do “grubby, sweaty, grunt work that no one else wants to do”. True to their intentions they spent their mornings digging ditches. They worked on a ditch for our septic system and one along our neighbor’s wall that needs to be sealed. They also finished priming the walkway. After lunch everyday, the team organized activities with our children including a three-day soccer tournament. Saturday a group of personal, faithful friends, came from San Diego to help complete some of the structural connections from the roof to the building which meant crawling into tight spaces and driving nails with a hand held nail gun. Hot and sweaty, they proved once again how good of friends they really are. PRAY - Pray that God continues to send individuals with skill-sets that meet our immediate needs (plumbers & electricians right now).Pray for Chuck our roofer. He still has not been able to make it back down to finish the roof. Pray that God would open his schedule. Pray that God would open his heart to the love of Jesus. Pray for physical and spiritual protection around the building, the volunteers working on the building, and around the entire project. SHARE - Use the share button to share this update with your social networks. This will get more people praying for the project and give others the opportunity to follow God’s command to care for orphans.